Retired expat, Tony Metcalfe, is going through a three-quarter-life crisis. Viva España, his bar in a mountain village beyond Spain s Costa Blanca, is failing. Tony started the bar for the English post-war babies who retired early on good pensions - the por favors, as the Spanish call them - flocking to the dream of wine, rest and sun around the pool. But now their retirement paradise is shadowed by Brexit: the pound has fallen, pensions are frozen and the property crash happened long ago. "A melancholy and moving family drama." "Told with humour and enormous compassion, this is a beguiling story about broken people who have all the feelings and none of the words. Utterly captivating." "C.M. Taylor's Staying On is a trademark sweet-and-sour Mike Leigh film in novel form. As well as a fictional retread of Joe Cawley's More Ketchup than Salsa. Updating both to our worrying post-Brexit times where the shifting of boundaries forces us to question where we truly feel we belong." "A wry take on expat life, astutely observed and deftly drawn. Peppered with humour, yet poignant and as topical as it's revealing. " "A timely tale about expats braving the Brexit tidal wave in rural Spain. I raced through this warm-hearted, warts-and-all portrayal of a broken family, its members fighting to love one another while haunted by the past and afraid of what the future holds. 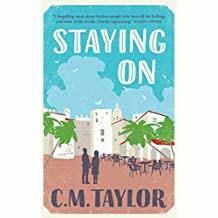 Funny and thought-provoking, Staying On is an ideal summer read." "Beautifully written by an author who's obviously a keen observer of people... a book I admired... I suspect that many people will love it." "Highly engaging... a sensitively written book revealing so many issues that all the family had been avoiding for many years. These have had a profound effect on every member of the family for different reasons. There has been an inability to deal with so much baggage that each member of the family has carried around for years and it has ruined their lives. The author has the ability to create likeable characters and brings them to life so you feel you really get to know them He also paints a vivid picture of life in this small community and the surrounding countryside. I really enjoyed this book it was different and a page turner. You will remember this family for a long time after reading. I have not written any spoilers as to do so would spoil the enjoyment."